The door's open; come in. 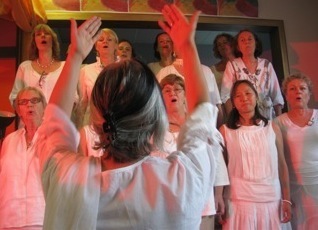 Sydney Threshold Choir began in December 2008. When invited, we sing quietly in groups of two or three at a bedside to provide comfort and peace. We have established relationships with Marion Aged Care Facility in Leichhardt and Neringah Hospice in Wahroonga. 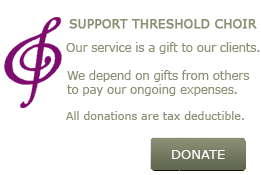 We also welcome requests from family and friends of people who would benefit from our service. We participate in community events such as the Dusk Ceremony at Rookwood Cemetery, Heart Songs for Life workshops, Good Grief Café, and Living With Our Dead picnic. This video was created at our November 2011 concert. The concert allowed us to introduce ourselves to the Sydney community and raise funds for our ongoing expenses. This article [PDF] was published in Inner West Courier in August 2011. We rehearse on Tuesday evenings, meeting at 6.15 p.m. for a 6.30 p.m. start, finishing at 8.30 p.m. We rehearse at The Marion (assisted living facility), which has a Low Care (Hostel) and a High Care (Nursing Home) at 237 Marion Street, Leichhardt NSW 2045. We welcome new members. To request singers at a bedside or to visit a rehearsal, please contact us by email.